Canadian Level I to III air carriers reported 81.6 million passengers in 2016, up 7.0% from 2015. The number of passengers flying on scheduled flights rose 8.2% to 79.2 million, while the passenger counts on chartered flights declined 21.5% to 2.4 million, as a major charter carrier, CanJet Airlines, suspended its services on September 1, 2015. These air carriers recorded 192.8 billion passenger-kilometres flown in their scheduled and chartered operations in 2016, up 9.5% from 2015. Total operating revenue rose 0.9% from 2015 to $23.0 billion in 2016. Total operating expenses increased 1.0% to $20.6 billion. As a result, net operating income edged up 0.5% to $2.5 billion. This amount, combined with a net non-operating loss of $966.7 million and adjusted for provision for income taxes ($142.0 million), produced a net income of $1.4 billion in 2016, up 38.0% from 2015. 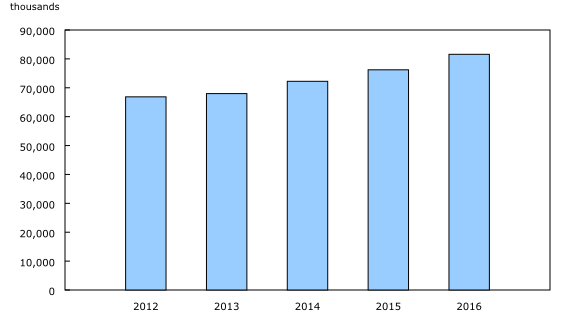 The 1.0% growth in operating expenses in 2016 compared with 2015 reflected the gain in all other operating expenses (including general administration) and in depreciation, which offset the decrease in aircraft operations. This category of expenses declined 8.0%, largely due to lower fuel prices. Canadian Level I to III air carriers consumed 7.2 billion litres of turbo fuel in 2016 and spent $4.2 billion to purchase the fuel. 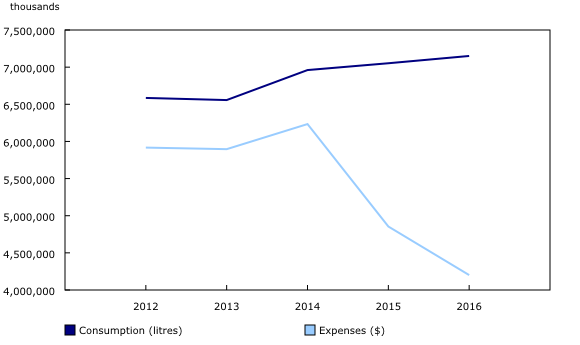 In 2016, fuel costs accounted for 20.4% of total operating expenses, down from 23.8% in 2015. In 2016, 89.2 cents of each operating revenue dollar were used to cover operating expenses. Aircraft operations accounted for the largest portion of each dollar, at 38.7 cents, followed by all other operating expenses (32.4 cents) and maintenance (11.6 cents). Total employment in the air transportation industry declined 0.8% to 55,030, while total wages and salaries decreased 0.7% (-$27.2 million) from 2015 to $4.0 billion. In 2016, wages and salaries accounted for 19.3% of the industry's total operating expenses, down from 19.6% in 2015. Total assets of the Canadian Level I to III air carriers stood at $25.7 billion in 2016, up 10.0% compared with 2015. This release covers Canadian Level I, II and III air carriers. Level II air carriers include every Canadian air carrier that, in the calendar year before the year in which information is provided, transported (a) at least 100,000 but fewer than 2 million revenue passengers; or (b) at least 50 000 but less than 400 000 tonnes of cargo. Level III air carriers include every Canadian air carrier that (a) is not a level I air carrier or level II air carrier; and (b) in the calendar year before the year in which information is provided, realized gross revenues of at least $2 million for the provision of air services for which the air carrier held a licence. Net non-operating income and loss are from commercial ventures that are not part of the air transportation services; from other revenues and expenses attributable to financing or other activities that are not an integral part of air transportation; and from special recurrent items of a non-periodic nature. Non-operating income can be, for example, capital gains from the sale of aircraft, interest income and foreign exchange adjustment, while non-operating loss can include capital losses and interest on bank loans and other debt. Beginning with 2016, the Annual Civil Aviation Survey is produced using Statistics Canada's Integrated Business Statistics Program (IBSP). Detailed information about the IBSP is available from the Behind the data module of our website. Changes were made to the collection method, questionnaire content, imputation and estimation, therefore users should exercise caution when comparing actual data to historical data prior to 2016.